This page is for the cover of the licensed song Garden of Love by MAKAI feat.青山テルマ, first seen in jubeat ripples. 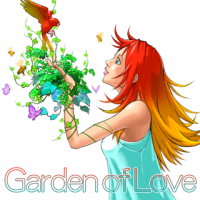 For the beatmania IIDX 3rd style song of the same title, please see Garden of Love. Thelma Aoyama has seen commercial success outside of her collaboration with MAKAI, having a single, Soba ni iru ne (そばにいるね), reach as high as #1 on the Oricon charts in 2008. Garden of Love was removed from jubeat saucer when the game was released. However, it was later revived on October 15th, 2012. It was then removed again on February 1st, 2013, and revived later on May 1st, 2013. It was removed again on August 1st, 2013. It was revived yet again on January 1st, 2014. Garden of Love was removed from jubeat prop on September 14th, 2015.